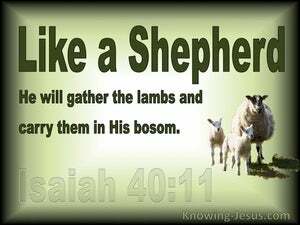 ﻿ Isaiah 40:11 Like a shepherd He will tend His flock, In His arm He will gather the lambs And carry them in His bosom; He will gently lead the nursing ewes. 10 Behold, the Lord GOD will come with might, With His arm ruling for Him Behold, His reward is with Him And His recompense before Him. 11 Like a shepherd He will tend His flock, In His arm He will gather the lambs And carry them in His bosom; He will gently lead the nursing ewes. 12 Who has measured the waters in the hollow of His hand, And marked off the heavens by the span, And calculated the dust of the earth by the measure, And weighed the mountains in a balance And the hills in a pair of scales? "As a shepherd cares for his herd in the day when he is among his scattered sheep, so I will care for My sheep and will deliver them from all the places to which they were scattered on a cloudy and gloomy day. "As for you, My sheep, the sheep of My pasture, you are men, and I am your God," declares the Lord GOD.